We had visitors in from Germany (Daniel and Natascha so we took them to the Mission San Juan Capistrano in order that they get and see some of California's history. The mission was completed in 1806 and destroyed by an earthquake in 1812. Today they are working, not to restore it, but to keep from being damaged any further by weather and to stabilize it from any further earthquake damage. The structure that is left is beautiful and the grounds are kept very pretty with lots of flowers blooming all year. The missions are little cities usually fully contained within walls. They were church's but they were also built as forts. They had to be able to protect the people living within the walls. They would have grown crops on the grounds where today there are flowers. 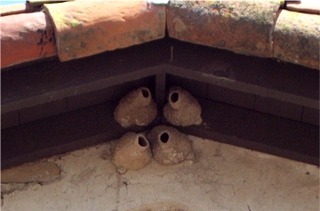 The nests you see in this photo are for the swallows who return to the mission every year in March on roughly the same day. When the padres noticed this in the early days of Capistrano they started celebrating it as a way to mark the coming of spring. We were there on a Friday and it isn't easy to get photos with out people in them. The place was teeming with school age kids who were there on a fields trips.